There's been plenty of talk about the English riots last week. There will no doubt be a lot more as politicians, police, religious leaders and all of us try to work out what all those riots mean for our society. I don't want to get into too much speculation, but just want to reflect personally on my experiences in Greater Manchester. On Tuesday night I was following Facebook and Twitter and watching the news as the riots migrated from Salford to Manchester city centre. I know a few people who live in the city centre so I was looking out for them on Facebook to see if they were OK. It is interesting that now we can all experience an event in a very different way that we did in the past. I was alone at home, but through the internet and 24 hour news I could follow the events in a very involved way as they happened, and also be part of a conversation about it all. Such events are challenging to anyone who has faith in humanity. That faith is challenged when violence and destruction seems to arise so easily and randomly. It's very depressing. But what do you do? You live out your values. You confront violence with non-violence, you confront destruction with creation, you confront rioting with tidying. It is easy to be angry, as many people were angry at these rioters. But the spiritual discipline I follow in the Way of Jesus asks me to confront hate with love, anger with compassion, violence with non-violence, war with peace. Last week made me realise how much it is necessary to wage peace tirelessly. As the riots were still ongoing there was already a Facebook and Twitter group calling people to action to cleanup the after the riots. This is an act of faith in humanity. The group in a few hours got thousands of followers - and the message went around 9am tomorrow - we are going to clean up. And so Wednesday morning I borrowed the broom from Bank Street Unitarian Chapel and headed into Manchester city centre. 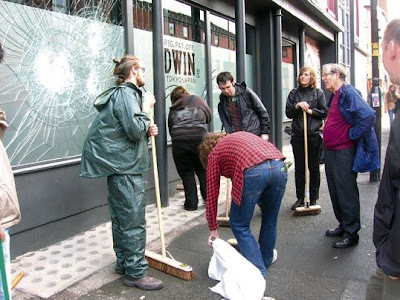 In the morning drizzle of Piccadilly Gardens people were gathering with the brooms, dustpans, marigolds and binbags. No one especially was in charge (how could anybody be?). I latched on to about a dozen people who looked like they were walking in a purposeful direction and we began patrolling the streets looking for glass to sweep up from broken windows. In all honesty the council had already done a very good job, so there was very little to do. We were all desperate to look for the tiniest speck of glass! Manchester has never been cleaner. The city was generally normal and going about its business. Some windows were smashed and some shops had been broken into (notably a jewellers I passed) but it didn't look terrible. If you weren't paying attention you probably wouldn't have noticed the damage. It was one of those occasions where it was perfectly natural to start conversations with perfect strangers - as we were all talking about the same thing. I spoke to a homeless guy (who of us considered the homeless population in all this? those who had no where else to go); he told us he had been threatened by the rioters and he had threatened them back. Cleaning up is not a long-term solution. But it is a symbol of faith. The broom has become that symbol of fatih, that symbol of humanity, and that should give us hope. As people of faith we're not called upon to be clever sociologists understanding all the problems and all the solutions. But we are called to get on the streets and do something; to live out the hope we claim; to wage peace on our streets. I did feel encouraged by all the people who got together to clean up after the riots - I think it's great, and a very hopeful sign. Thanks Stephen. Don't ever stop telling it like it is.love must win in the end.